Many of our clients that previously used traditional data loggers to do this are now opting for the more convenient and cost-effective option of GPS Track apps. In our latest blog we provide an overview of the favourite apps, as well as available add-on options that advance reporting, data and video quality. ‘Pay As You Go’ purchase £2.99 per session or £4.99 for unlimited sessions per day. Subscriptions start from £19.99 a month. When considering investing in one of these apps, it’s important to note that the stand-alone versions rely on GPS data gathered from your device’s internal GPS sensor. This will never be as powerful or accurate as a dedicated GPS receiver. The apps listed in this article are compatible with external GPS sources, as well as OBD-II dongles to provide more accurate data and vehicle dynamic reporting. For those of you wanting to show off your best laps in style, you can also upgrade the video quality with dedicated action cams such as GoPro Hero 4. To find out more about compatible upgrade options, Harry’s Lap Timer founder, Harald Schlangmann, has written an in-depth article listing recommended accessories – click here to read. When asking the CAT Community to recommend their favourite apps, we received a lot of praise for the Aim Solo 2 lap timer. 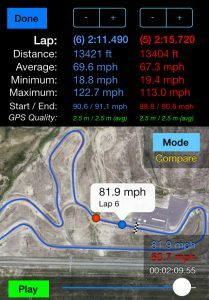 Despite it not being an app, this precise yet simple GPS recorder can sync with either your PC or iphone for data analysis – perfect for identifying new racing lines and corner approaches. Currently retailing for around £360 it offers a happy medium between the simplicity and convenience of apps and the more traditional performance meters such as Racelogic’s PerformanceBox . 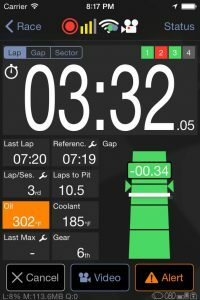 If you are seeking the ultimate in GPS accuracy, car performance data and stunning wide-angle HD video with graphic overlay; the traditional data logging systems are still favoured amongst racing professionals due to their power and the quality of dynamic data. The latest VBOX Video HD2 is used by well-known car manufacturers but will set you back around £2,724 for the entire package. So … which option is best for me? The benefit of the increasing variety in the market is that performance data is now accessible to all levels of driver. You can start with the free apps to dip your toe in the water, then slowly upgrade and add-on external devices as your driving journey evolves. 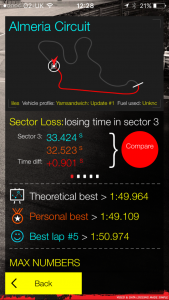 Phones only really work with external GPS, this will suffice for most track day users. If you’re a track day hero, buy an Aim Solo, this will cover all of your needs. If you’re racing, then invest in something that gives you brake pressure and throttle too!! The fastest upgrade for your track or racing performance is your driving technique. Our tailored track and racing courses allow you to hone your skills and unlock your potential and that of your car. Our coaches have years of experience in both professional racing and engineering and will also work with you on vehicle set-up. To train with the best dynamic coaches in the UK contact us for a chat on 01234 757 633 and discuss your personal driving objectives.